Earlier rubber flooring was mainly used in restaurant and other commercial uses. In the recent times rubber kitchen flooring isn’t just for commercial kitchens anymore. Rubber flooring in your kitchen saves your knees and back from the strain associated with hours of standing, it’s slip resistant, and durable. Rubber flooring is good not only for kitchens but also commercial establishments, playgrounds, and decks. Rubber flooring in residential kitchens is as important as it is as a professional kitchen floor. Related Reading: Check out our best choices for kitchen flooring – complete with reviews and comparisons! The benefit of rubber flooring is not only for the people using and cleaning it, but also for the environment. Rubber kitchen flooring for restaurants is logical, but don’t let that stop you from using it home too. Rub-a-dub-dub, three men in a tub, what are your kitchen floors made of? Rubber is not just for tires anymore. You can install rubber flooring in your home or restaurant kitchen. There are many different reasons that people turn to rubber flooring to cover their floors. The kitchen is an especially good area for rubber flooring because it is slip-resistant and easy to get clean after those spills and accidents that can occur in the kitchen. There are many benefits of rubber kitchen flooring. The reasons people install rubber flooring in their residential and commercial kitchens includes the fact that it is durable, cushiony, non-slip, and easy to clean. Rubber flooring is also very durable and can withstand years of wear and tear. This flooring is comfortable enough to stand on for many hours, which is common when cooking and baking, because it helps to reduce leg and foot fatigue. It is also very easy to clean, which is why it is used so often for professional kitchen floors. And the fact that rubber is a non-slip surface makes it great for areas that are susceptible to having liquids and greases spilled which are very common in any kitchen. Rubber flooring is not just used in commercial kitchens but it is also used in many commercial establishments. In addition to using it in restaurant kitchens, it is used on sales floors, in day care centers, and as restaurant flooring. Rubber is also good for decks and playgrounds. The wide variety of colors and shapes that rubber flooring offers makes it a choice that many home and business owners turn to. It creates a beautiful, durable floor that will last for years and years. Rubber flooring comes in tile, interlocking tile, and sheet form. You can also buy different shapes and sizes to mix and match the colors and shapes creating a custom floor, and one that will last for years. Rubber flooring can also be used just in the high traffic areas where spills are common, such as in front of the sink, stove, and food preparation area so that you can help reduce falls and slips. Because the color runs entirely through the flooring, the color will remain bright through the years as well. With a little cleaning and maintenance, your rubber flooring will last through years of traffic and abuse and that is the reason why most people use rubber kitchen flooring for restaurants. The added benefit of rubber flooring is the fact that it is environmentally friendly. Rubber flooring can be made from recycled rubber. This means that the rubber that would normally be thrown into the landfill is being repurposed for flooring. This is a great way to keep our landfills less full. Rubber flooring for your kitchen is great because of all of the traffic and all of the different activities that happen in the kitchen. It is a non-slip surface, which is great for the kitchen where liquid and grease spills occur. Spills on rubber flooring are easy to clean. 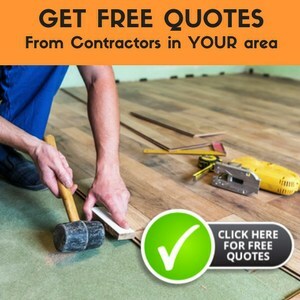 You may choose any kitchen flooring but one thing that we all need to keep in mind is that maintenance is highly important especially when it comes to kitchen. Thus one should always go for an option which will be easy to maintain yet stylish and long lasting all at the same time. You don’t need to compromise on style factor when it comes to rubber flooring and the best part is it is economic too. The variety of colours and shapes gives rubber flooring another good selling point. You can simply use your creative skills to enhance the look of the kitchen using different shapes and colours that are available for rubber flooring. No matter what your decorating style is, you are sure to find some rubber flooring for the kitchen of your home or restaurant that will look great. As it is already said, you can use it in other places as well. So rub-a-dub-dub, three men in a tub, now we know what your kitchen floors is made of. Hi, Can you recommend a sealer to put down on a plywood floor before I put down padding and carpet? I inherited my aunt’s bungalow, and she had incontinent pets. Despite vinegar, bleach and everything else, the floors in three rooms still smell, especially when the house is closed up for awhile. Is there an inexpensive way to “Seal” off the stink? I’m afraid just padding and carpet won’t do it. The house is charming, but unliveable because of the odor. Any economic suggestions? Thanks. I requested samples for rubber flooring and this is the response I received. Ever hear of this? vegetable fats spilled on the floor may actually break down the rubber over time. Pretty odd, since there are resaurants that use rubber flooring. I would think it’s going to depend on the manufacturer. Hello, I found my deal at Rubber Flooring Inc. They provided me with rolled flooring for only $1.45 per sqft. By far the cheapest online.